You are here: Home > Samsung Galaxy S III Makes Cameo Appearance In Samsung Slide? 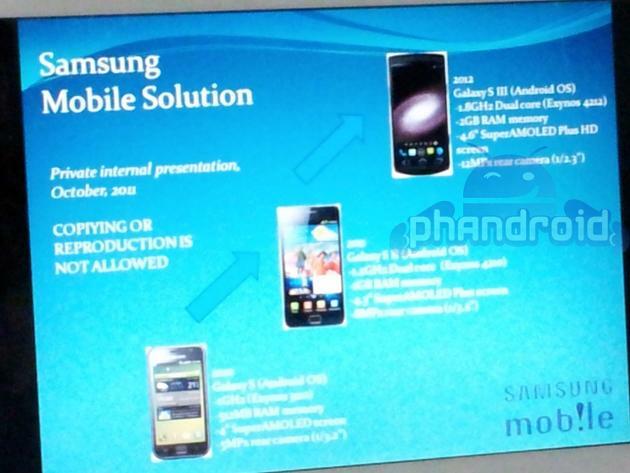 Samsung Galaxy S III Makes Cameo Appearance In Samsung Slide? The timing of this news couldn’t be any better as we’ve finally arriving on Samsung Galaxy S II pre-order day for T-Mobile. Given the leaked slide above the Galaxy S II already looks like yesterday’s news as some details are now leaking out on a possible successor, the Galaxy S III. Let’s just kick this right off and say that we have some skepticism surrounding this document as does Phandroid, the benefactors of the insider who sent this over. So with a bucket full of grains of salt at our feet let’s dig into this slide. The processor will remain dual-core and stick with the Samsung Exynos family of processors that powers most of the Galaxy S II models save for the T-Mobile version. The processor itself will get bumped to Exynos 4212 running at 1.8GHz and a RAM bump up to 2GB. The rear facing camera gets bumped up to 12 megapixels and will feature a CMOS sensor greatly allowing for improved image quality in low light situations. Last but not least is the 4.6″ Super AMOLED Plus HD display which is truly a mouthful but is also the very same size as the rumored Galaxy Nexus/Nexus Prime. According to the anonymous tipster the slide itself is missing a few more pertinent details including LTE and NFC capability, Ice Cream Sandwich Android on board and has four physical buttons. We should come back around and say this mystical device almost too good too be true and it’s possibly because of the misspellings and spec errors in the slide. Of course those kind of things have happened before and will happen again so we’re chalking this one into the hopeful but wild rumor category. What do you think? Mystical phone or spot on? It’s either fake or samsung can’t spell “copying” correctly. First, this is just an internal presentation and it doesn’t mean they have a product with those specs and the product doesn’t necessarily need to exist. Second, I’m not saying this is real either, BUT, it’s an internal presentation, “Samsung” is not a computer, Samsung is a company made up of bunch of people, so a human wrote this presentation and human make errors. I get the whole grammar police thing, I do it sometimes, but this is getting out of hands, invalidating something because of a spelling mistake? Ridiculous. And Samsung is a Korean company so maybe they had a non-native English speaking employee write this slide up. Spell check works on all computers. Yea, that’s why there’s an “or” in the statement. It could go either way. No assumptions being made, only possible scenarios. They are producing these devices too fast (in my honest, personal opinion)! They need to focus on making them run right in performance, & then match that with the feature & spec set. I wish they stop pushing out multiple devices in the same time frame. I whole heartedly agree with everything you’ve stated. I agree with you overall and I really think you will start seeing a slowdown in new phones. Computers went through the same steep growth curve and now are a little more static. At some point people will stay happy with their device as the newer “toy” is not that much better. why on earth would they go with a 12 mp camera when they just released the 16 mp cmos chip a few weeks ago,,,,I smell a big fat hairy fake. so they can release another device with a 16MP sensor months later. Profit. Shame on you David giving people reason to skip the GS2. I cant wait to get mine wed. though. Either way I don’t think you’re making a mistake with the GS2 :) Good luck! Shame on David? Hes only doing is job on putting up rumors and writing articles etc. If you want to skip out on the GS2 then that’s your decision. David never said, ” You shouldnt get the GS2 because there might be a GS3 coming up ” its up to you. It really wasn’t that serious. fake. Internal memo’s can spell copying. Fake or not, this madness needs to slow down….not stop…I can dig the insanity of it all. Just like doing PC hardware upgrades! 4.6 superamoled HD??? ?1.8/ duaL core exynos?12 mp camera?????2012???? ?……….going nutscould be nexus prime . Sweet and verizon best not screw up and not get this phone. I love android and all the things it gave me back when the G1 came out, while being on t[mobile with no other choice. I have reminded loyal, but I have a feeling that ice cream sandwich will not be as good as anticipated. starting from those huge buttons on the screen, and those 4…. s bunch of screens that are so big that are getting annoying. I just don’t know. but i know that if there was an iPhone 5 instead of a 4s or just a 4s on t-mobile at least I would have pre-ordered it along with the other million. when the video of ICS came out, I kinda felt like it looked like a nice looking cooked ROM. Im certain the GS2 will get some pretty fancy ICS based ROMs early next year to choose from. I just cant wait to get hardware UI acceleration already! With all these new phones coming out they really need to start letting us upgrade earlier with a decent discount off of the outright price. Like 30% off after 1 year and 50% off of 2. Technology is changing so fast that the rest will follow and sooner or later some applications may not even run on a phone that’s only a year old. I wouldn’t be surprised if in less than a year most of the apps on the Android Market not being able to run properly unless you have a dual core processor in your phone. It will be like software for your pc… Unless you have a decent graphics card you can’t play certain games. Or if you don’t have a more recent version of windows you may just be out of luck. In this case it would be the Android o/s which I heard ice cream only runs on dual core processors. Looks like I am outta luck with my G2 and I still have over a year left before I can upgrade. Looks like the touchwiz version of the Nexus Prime. The shape of the device is similar to that of the leaked Nexus Prime videos. Me too i bought my Vibrant last year love it and now i can’t wait to get the Galaxy S 2 or what i call the Vibrant II lol. But i have to buy it off contract oh well its worth it. Tge real galaxy sIII will most likely have a quad core exynos processor when it is released. Why is copying misspelled “COPIYING”? LOOKS FAKE. Probably fake but Im sure Samsung is working on the successor to the Galaxy S II for release next year or so. Im sticking to my Samsung Vibrant for now and when my contract is up I’ll just get the Nexus of that time (as they seem to be released yearly) or what ever galaxy s phone is current at the time. On another website, I can’t remember which one, it said the Galaxy S III would more than likely release in June of 2012 with an Exynos processor running at 1.8 or 2.0 GHz. It would definitely have Ice Cream Sandwich, 1 to 2 GB of RAM, minimum of 8 GB internal storage, Super AMOLED plus and at least 4.5 inch display. They also said the camera would be upgraded, but there was no picture of the device. Also it said that RIM would be releasing their first superphone some time in the second quarter, so as to not conflict with with Blackberry 7 which will be done away with and a virtually new OS will replace it. I forget the name of it. I’m not saying this is all happening. I’m just saying this is what I read on a website that claimed they had leaked documents and some spokesman, supposedly. Oh to choose? Amaze, s2 or the prime? It looks like a Sasmsung Wave. Real. The word “copiying” is an intentional typo used as a fingerprint to identify which meeting this was leaked from. Each meeting would have a different typo somewhere. The guy who leaked this is probably getting fired already lol! Will there be a keyboard on this thing?